As a homeowner, you know how important it is to keep the exterior of your property looking smart and tidy. Every part from windows and doors, to lights and plants can make a huge aesthetic difference and give your home that added kerb appeal that’s needed. But knowing how and what to do can be the first hurdle to jump, which is why we provide solid advice and know exactly what to recommend to create a stunning entrance for your urban home. Front doors are perfect at setting the tone to what lies behind, which is why you should never compromise on the price of quality, especially when it’s going to be judged by every person that visits your home. Finding that perfect front door is the hard part, but our 30 years of trading experience puts us in the perfect position to provide you with a timber door that will leave your neighbours turning green with envy. One of the most important features of your door is the style. You don’t want it to look out of place in comparison to those on your street, or the design of your home, as it’ll stick out for all the wrong reasons. Instead, you want to be known for having a front door that showcases your property’s period and character, and whether your home was built in the Georgian, Victorian or Edwardian era, we have something that’ll suit all three. Georgian doors were, more often than not, solid and contained no glass. Light was usually gained through a fanlight above the door which would sometimes incorporate a bespoke bar design or even be arched. The symmetrical aesthetics in Georgian design lends itself perfectly to our Chadlington, Bevington and Clifton styles, with their classical composition and decorative panelling, these fit beautifully into Georgian townhouses. However, these designs can be adapted to incorporate areas of glass for additional light if required. 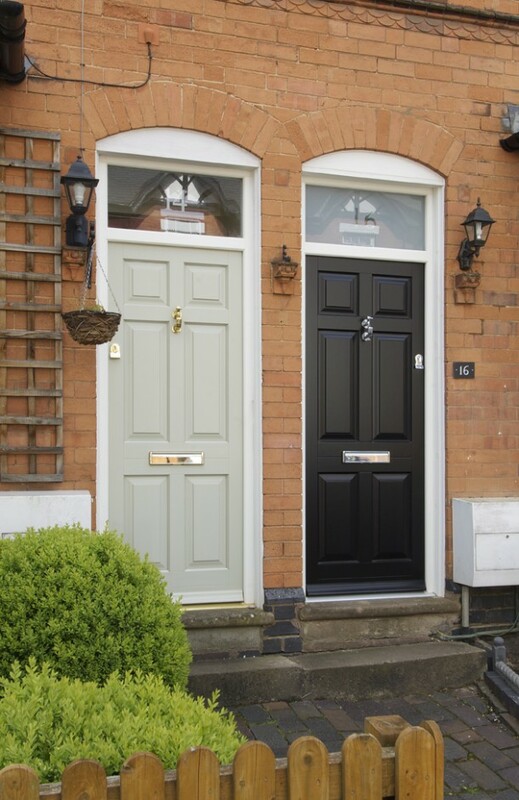 If your property was built in the Victorian period, then a front door like our Kingston or Frenchay would fit perfectly. This era fostered a whole range of architectural styles and as Victorian front doors are one of the most popular types of front doors in the UK, it comes as no surprise that many of our clients like to add an ornate and personal touch to the glazing, to make it their own. Our ‘Signature’ range of leaded glass is hand made the traditional way and then sandwiched between 2 pieces of toughened glass for insulation and security. Incorporating this into your door or fanlight gives historic style that cannot be replicated with modern methods of glass manufacture. Or why not include your house name or number into the glazing by either etching the surrounding glass and having the font clear, or by etching the font directly onto a clear background. Both methods look superb! Our new range of conservation doors are aimed specifically at Victorian properties and offer some of the typical intricate designs seen throughout the era. Consider our Wakehurst, Westonbirt and Calderstone if you really want to make a statement. If you’re lucky enough to live in a gorgeous Edwardian townhouse, then we recommend our timeless Abbotsbury, Polstead and Osberton doors, or adapting one of our aforementioned styles to create a bespoke front door for your home. Many Edwardian properties have wider porches and the doors would often contain leaded decorative glass or a star etching for privacy. After deciding on the ideal design for your door, the next thing to consider is what colour for it to be painted. This needs some careful thought and consideration, to ensure you create that striking impact without looking like the odd one out. Take a look at what colour your neighbours’ doors are to gather a sense of belonging, however don’t be afraid to be brave and go bold. Dark reds and blues look elegant against a traditional red brick house, whilst chocolate brown and sage green are an authentic choice for a Georgian door. A daring purple or yellow can create be an eye-catching statement, however, if you’re stuck in the middle then go for black, it’s a timeless colour that looks sophisticated on any townhouse. The final consideration for your door is something that can often be overlooked, but when you have a period property, it can make all the difference. If you’re a Georgian home-owner it’s important to note that the door hardware was painted black, and almost all doors had a round or octagonal door knob, half-way up the door and positioned in the centre. Victorians had maids who polished and cleaned the doors, so door handles, knockers and letterboxes were finished in brass and always kept shiny. But by the time the Edwardian period came round, door furniture had changed back to being a dark, maintenance free finish, so you can expect to see black, bronze and aged brass door accessories. 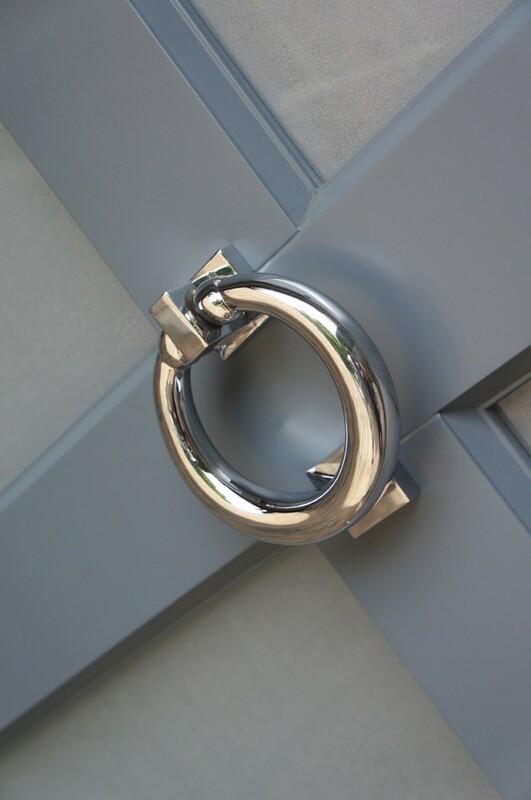 Try adding chrome or polished nickel hardware to a dark door to make a real feature of the hardware. Our specifically designed ‘Townhouse’ lock gives you the same full height integrated locking that you get with our handle lock but without the handle. Turn the key around twice and this engages all of the locking cams and hooks whilst leaving the outside of your door clear for adding further furniture like a door knob and letter plate. Not only is it the appearance of your front door than can affect how you and others perceive your home. Your windows are an equally important part of the equation, especially if you live in a terraced town house, and those around you are kept in immaculate condition. 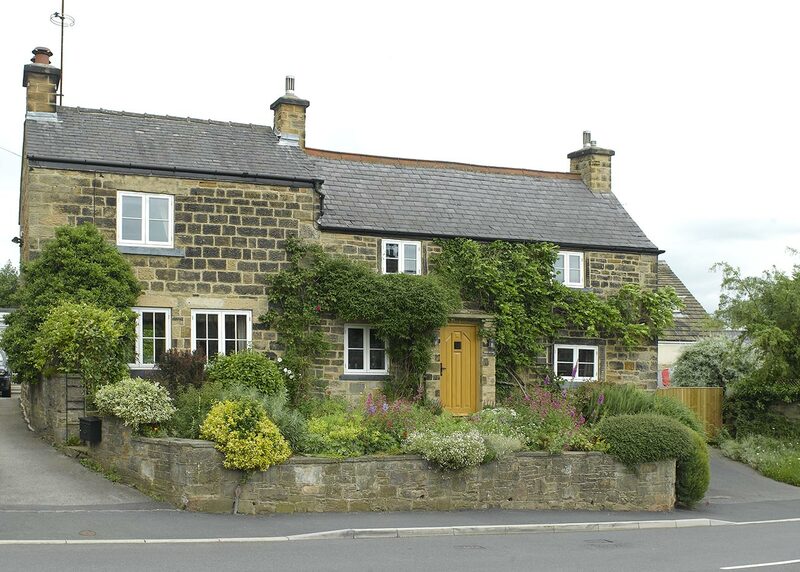 Here at Timber Windows, we have a range of styles that are suited to different period properties. The proportional element in Georgian architecture characterises properties from this period, and windows are a big part of this symmetrical design equation. Glass could only be manufactured in smaller pieces back in Georgian times which resulted in the most common style of a ‘six-over-six’ pane Box Sash window. These panes would always be portrait rather than landscape and give the property that regal look. Although the Victorian era nurtured many different design styles, the character of the window remained virtually the same, with Box Sash Windows being the most popular choice. Glass could now be produced in larger pieces and made way for the ‘two-over-two’ design. Our traditional Box Sash window allows you to tailor the elements to your property to restore or retain its period heritage. 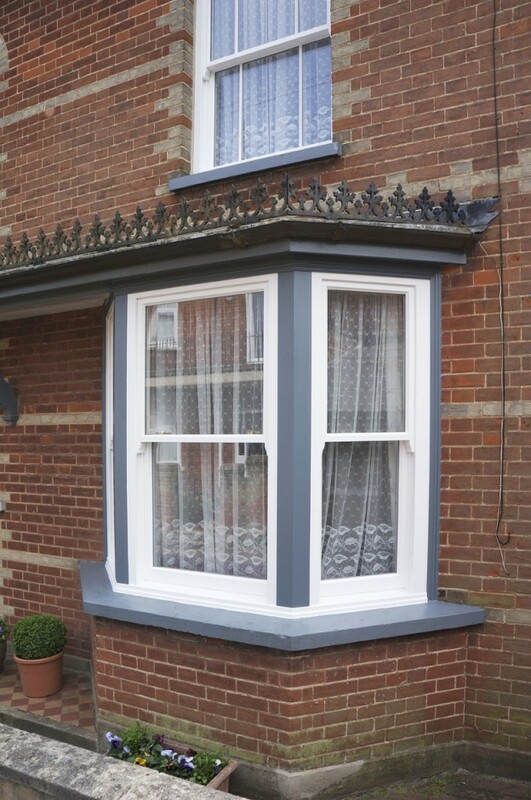 The biggest change to windows in the Edwardian age was the introduction of bays. Great towering structures allow more light to flow into the rooms and give Edwardian homes a particularly grand appearance. Sash windows continued to be a well-loved choice but casement windows were often used on the sides and backs of properties where smaller windows were used. Our Traditional Flush Casement windows complement our sash windows perfectly. Your property’s character will affect how you should paint your windows. Traditionally, Georgian windows were painted burgundy and sage greens and Edwardian windows were painted to match any exterior woodwork. However, many home owners choose to keep it simple yet elegant by coating them in cream or white. However you decide to paint them, make sure they are keeping in with your home’s character and your neighbour’s style. To finish off your traditional townhouse look, we recommended putting some time into sprucing up other exterior elements. If you have iron railings, add a lick of black paint with a gloss finish to create a stunning effect. Neat plants and bushes can capture attention of those passing by, and boost your kerb appeal instantly. At Timber Windows, all of our windows come with the option of single or double glazing, and both our doors and windows are fitted with high-quality locking systems. To find out more on how we can help restore your town house’s character, give one of team members a call, or fill out our enquiry form and we’ll be in touch!